jewelyah | Welcome please look around. I remade the You Look Marvelous card. It was for my sister & she didn’t like the inside. First thing I changed was the color I switched from the pink to turquoise. Inside I got on line & found a clip art of these dress forms that go with my color scheme. I then cut out the WOW using my Cricut. I used a little bling on the exclamation point. I hope she likes this one. I did end up buying blue & purple card stock so I could make this again maybe for another occasion. Change the 3 blings on the front & the color to blue you could have a baby boy card just as fast. What card did you like best? Card 1 or 2? Inside it says “Delight In Life” This card was made for someone who lost a whole lot of weight. What do you thing? Sorry, tonight I put my time towards scrapbooking. Jeff & I spent some time sorting pictures so we think we have all of Anchorage AK together. Then I can go get pictures made of the ones I want to scrap. Problem I fell asleep at the key board again. My excuse is I had to work today. Anyway because I didn’t finish picking out pictures I didn’t get my posting for tonight out. Sorry. Off tomorrow & will try. 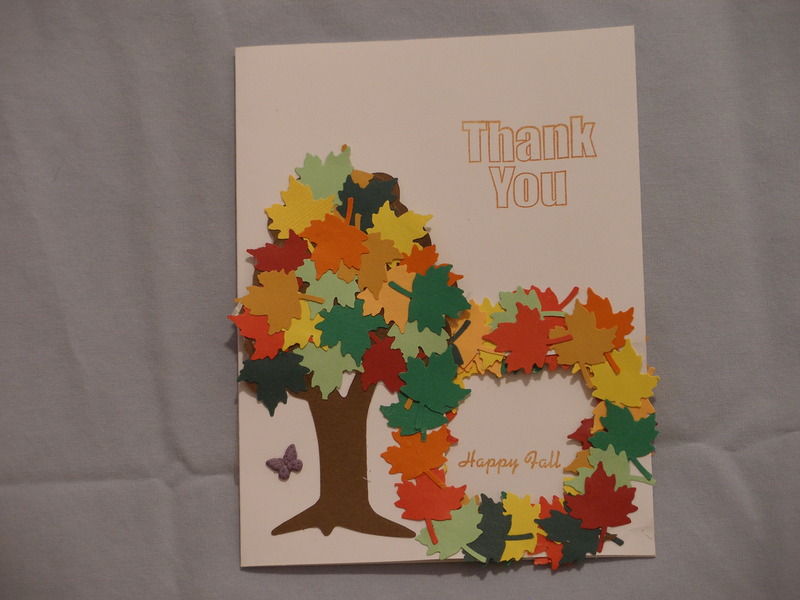 I had taken this piece of red paper & punched leafs for a fall card I had made. I used a Martha Steward leaf punch. I noticed that the paper was about the size of a card. So I attached some yellow card stock to the back. 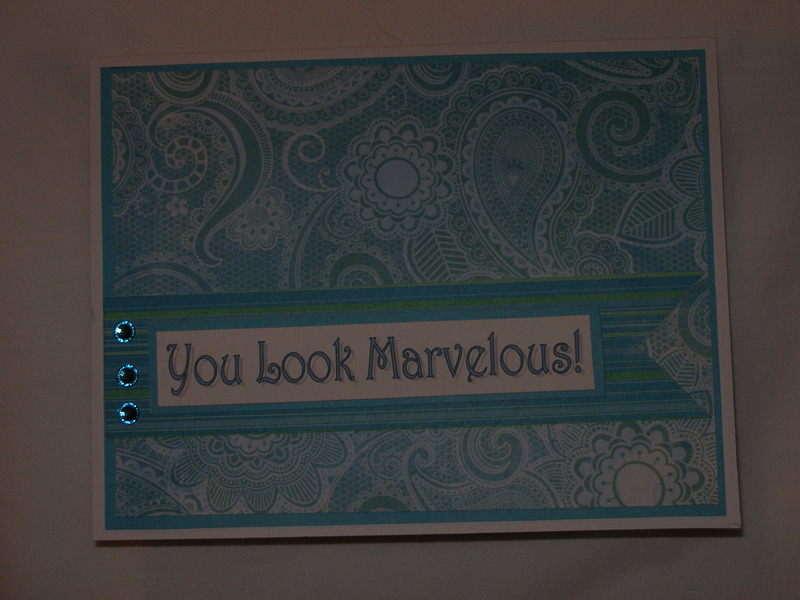 Stamped Thanks on the front & attached it to a premade card. I just had to cut it down a little. The inside is blank. I’m never going to finish the last page of The Wild Animal Sanctuary. After procrastinating all day even to the point of having Jeff check Safeway when he went shopping, I went to get a roll of double-sided permanent tape at Michael’s in Greeley. I get home & find I got one-sided tape. Ugh! Sorry but I spent the night scrapbooking. Got 3 pages of the Animal Sanctuary done. Very plane but sometimes you just need to get the pictures documented & don’t have time for the fancy stuff. I have decided to go back on the Animal Sanctuary pages & add a little bling. This makes me feel better about the plane pages (7) I’m going to do. 3 down 4 to go. All are already planed out. It was easy you divide by animals (Lions, tigers, bears, wolf’s & camel that might end up on the wolf’s page. Not sure yet. Ok almost planed out 🙂 Everything is subject to artistic privilege. First I punched out several leaves using a Martha Steward leaf punch. I die cut out the tree in brown using Sizzix. I then attached the leaves to the tree. 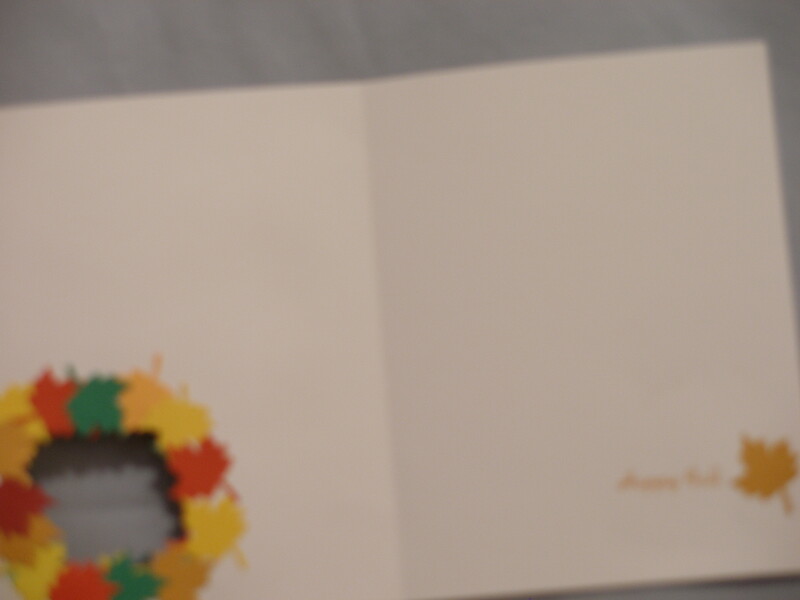 I die cut a circle in the premade card that I outlined with leaves. 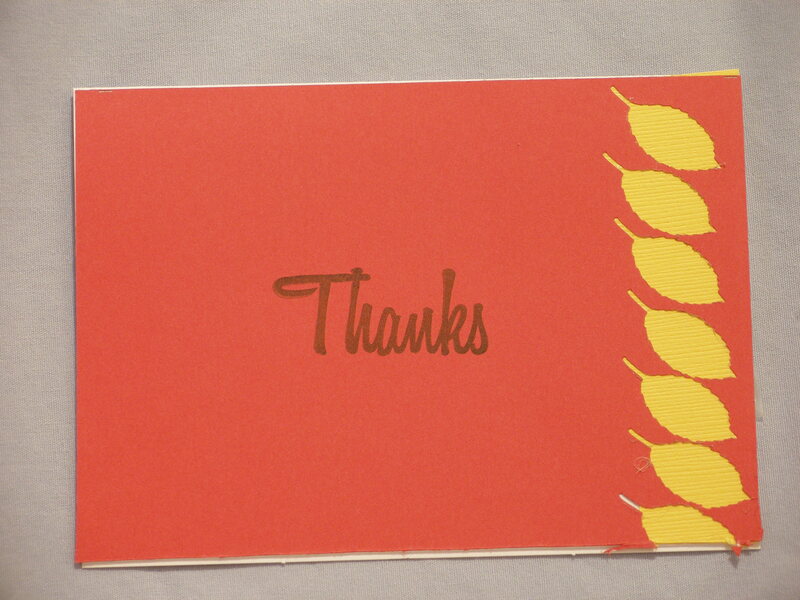 I stamped the Thank You. Taking a stamp about fall I used masking tape & taped off all but the Happy Fall. I then stamped that into the circle so you will see it on the inside & then outside. I glued on a small purple butterfly left over from other projects.